Stampin | Stampers With Altitude!!! I have never been asked to be a part of any design groups before and I am super excited to be a part of this one! 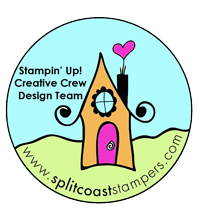 The Creative Crew on Splitcoaststampers.com asked me and couldn’t hardly contain myself! I love challenges!! So! I want to give you a bit more details on some of the challenges for the month of May. The theme for May is “Sweet Surprises” or “Suite Surprises”. I want to show the first challenge. SIP – Step it up! – Create a CAS project of you choosing with the theme in mind. Then create a second project, amped up with more enrichments, additions, layers…whatever you choose to really step it up. So, here is my clean and simple card. I chose to make it a Sweet Suite Card. hehe. I used the Cool Treats Suite for both cards. I cut a Whisper White piece of paper that measures 3 x 5 1/2″. I used the exact same size on the stepped-up version too. This piece is popped up with dimensionals. This card uses the Cool Treats Stamp set and Frozen Treats Framelits… plus, I just used the Tasty Treats washi tape as an accessory. You will also notice that I have a banner (though it’s hard to see) popped up on the card as well. I inked up the sentiment with chocolate chip ink, except for “sweet” which is in Watermelon Wonder. This card, however, I used Watercolor paper instead of Whisper White for the 3 x 5 1/2″ piece and the banner. I used the Tasty Treats DSP, the Sprinkles Embellishments, added a spoon with silver foil, added a highlight on the ice cream dish and a water color background in Peekaboo Peach. Tomorrow, i will show you the second challenge, stay tuned!